Our family enjoys trying out different types of soups. 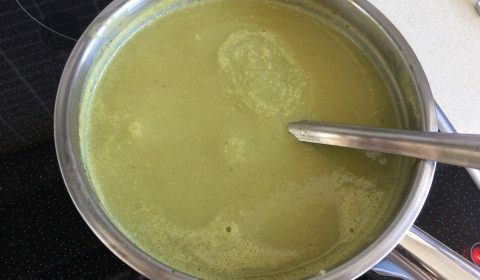 I had earlier mentioned in my other soup recipe (“Mix vegetable soup with beetroot“) about the differently colored soups made with various veggies. 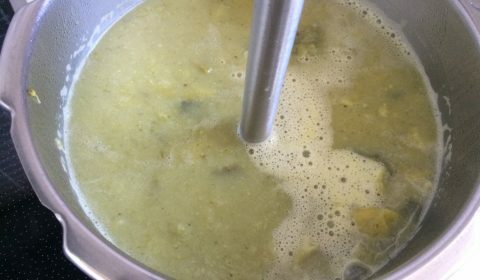 The Broccoli leek potato soup falls in the category of green soup – made by using green color veggies -spinach, peas, green capsicum, cabbage, bottle gourd, almonds, broccoli, Brussel sprouts, leeks. 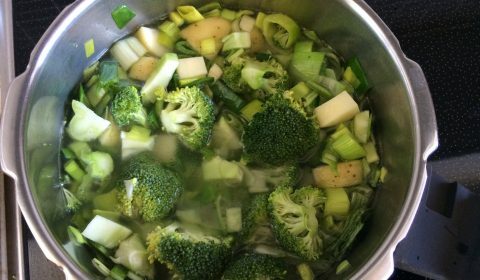 Since my son enjoys different types of thick, creamy soup I am happy to make and feed him different veggies in the form of soup. 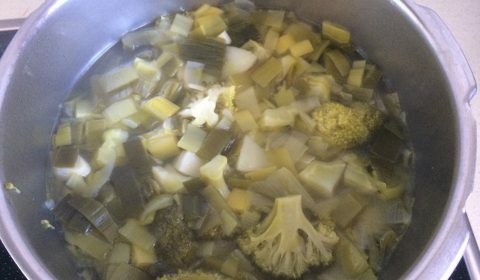 Soup is a good way of treating your body with many veggies together. 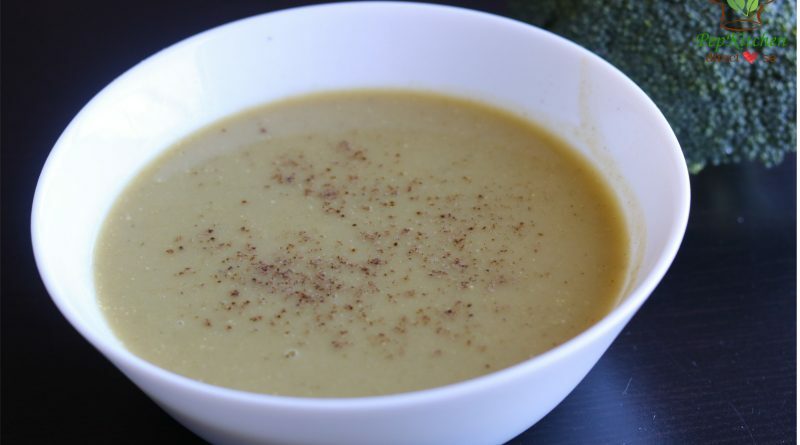 Broccoli, leek and potato soup is a thick and creamy soup. It has light green color. 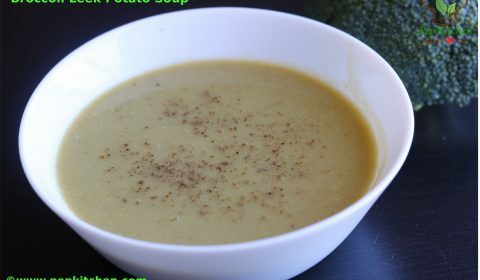 The soup has a creamy texture without adding any cream to it. 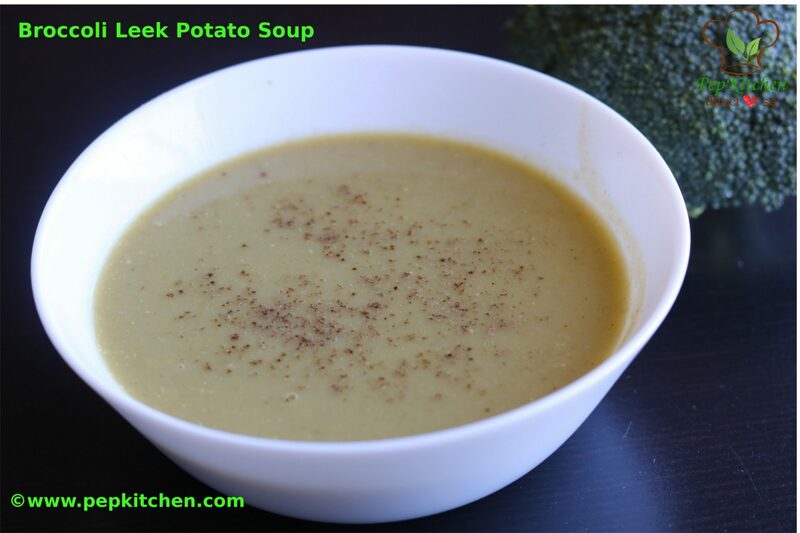 The potato gives thickness and makes the soup creamier. 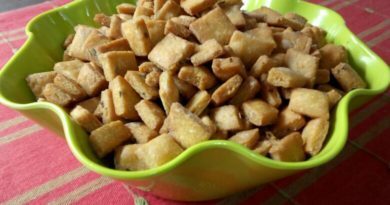 Since the soup is thick, it can be enjoyed as a one meal dish. 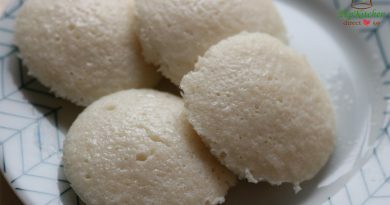 Friends do try out this recipe and share your views and comments!! Happy healthy cooking!! 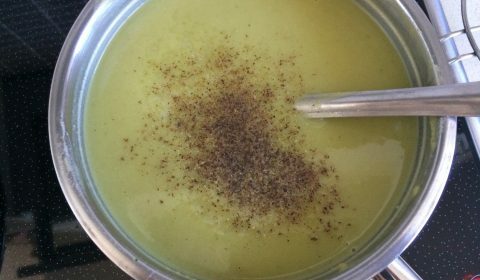 Broccoli Leek Potato Soup is a very healthy, thick and creamy soup made with broccoli, leek and potato. It is good for a warm winter night. 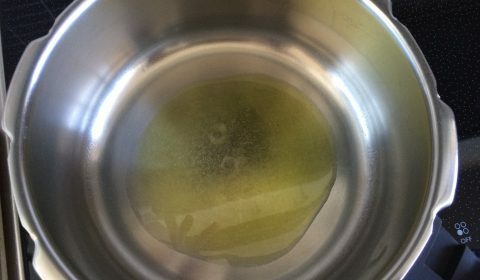 In a pressure cooker pan, heat olive oil on medium heat. Add the chopped garlic and leak. 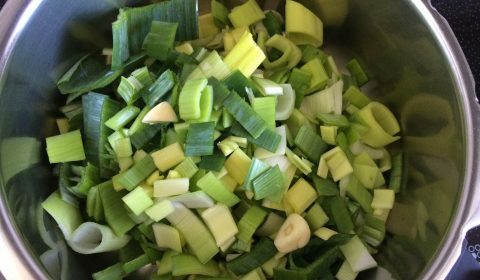 Saute till the leek shrinks. 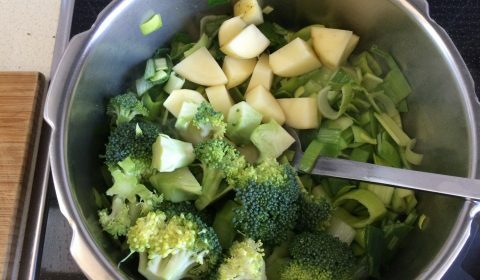 Add the chopped broccoli and potato. Mix well. Add water. Mix well. Close the pressure cooker lid with the ring. Put the whistle and cook for 4 whistles on high heat and 2 small whistles on low heat. Let the pressure cooker cool by itself. After the pressure cooker cools, remove whistle and open the lid. With the help of stick blender, blend the cooked ingredients till smooth. 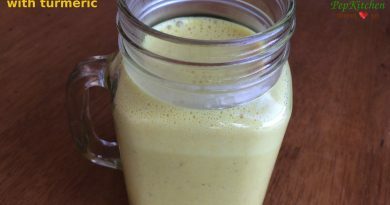 (If you want to blend the ingredients in the mixture jar, let it cool down completely and then blend). Put the blended mixture in the pot. Season with salt and pepper. Mix well and let it boil for 10 minutes. Serve hot soup in a bowl. Sprinkle some black pepper powder and serve.